This is an example of a woody stem, which has undergone extensive secondary growth. Note the cambial zone, which contains differentiating secondary xylem tracheids, vessels and parenchyma (2X). 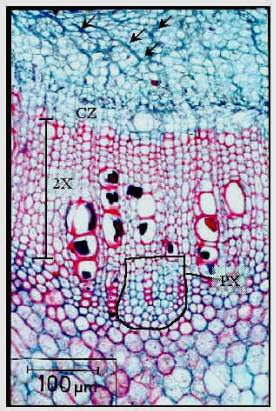 Some of the phloem tissue exarch to the cambial zone (CZ), is crushed (arrows). Look towards the bottom of this micrograph and you can see the primary xylem (PX) (outlined with a black line) which is separated from the cambial zone by a number of secondary xylem tracheary elements. What do you think the large black structures are that you can see inside the secondary xylem vessels?